← Bu Halima-"Dust is My Destiny"
It was built under the rule of Alauddin Khilji, of the Khilji dynasty (1290–1320) in the thirteenth century. According to local legends, it was a ‘tower of beheading’, where the severed heads of thieves and Prisnors’ of War (PoW) were displayed on spears through its 225 holes, to act as a deterrent to thieves and people who might consider breaking the law. 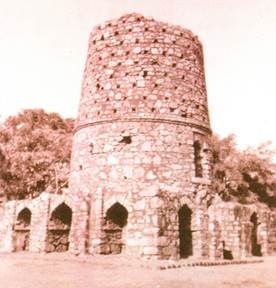 Although some historians suggest that the Khilji king slaughtered a settlement of Mongol people, nearby, to stop them from joining with their brethren in another Mongol settlement in Delhi, the present day locality of ‘Mongolpuri’. Alaudin therefore, apart from killing also destroyed prospective flourishing careers! 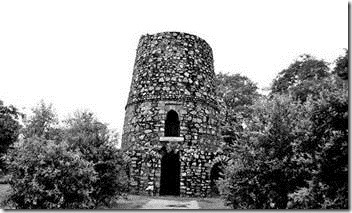 The locals say that when the number of heads exceeded the holes, the ‘less important’ ones were piled in a pyramid next to the Minar. The emperor made sure that no head was missed from the public view so that he could scare away everybody who dared to speak up against the emperor. During wars, only the heads of chiefs were displayed; those of common soldiers were simply piled into pyramids. Today, the Chor Minar stands with its gory past either faded or forgotten. 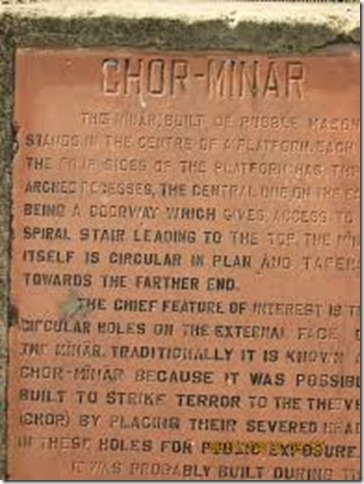 This Minar is built of rubble masonry and – stands in the centre of a platform rising from a platform. Each of the four sides of the platform has three arched recesses, the centre one being the east of the doorway which gives access to a spiral stairs leading to the top. 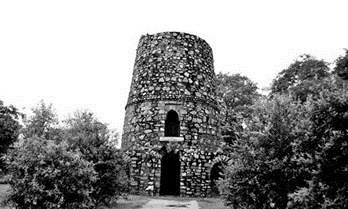 Vikramjit Singh Rooprai wrote in the post: “This tower makes lot of sense because this area was known to be the dense belt of thieves. Caravans were forced to rush out of this area and no one ever wanted to stay near it. 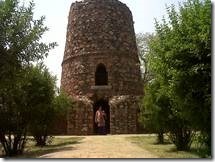 This Chor Minar could probably be to scare those thieves”. I had responded: “I see. So it was strategically built. Must have been a smelly structure”. Vikramjit Singh Rooprai: “I think so”. Recently a thought struck me. The tapering tower of ‘Chor Minar’ looks unfinished/broken. They say Chor Minar is haunted. A very likeable fact, giving rise to immediate acceptance owing to his hideous past. 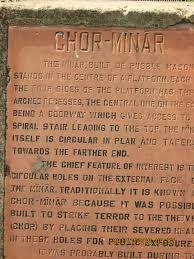 But, a haunted Chor Minar in the centre of a local roundabout of a posh locality??? An unpalatable fact! 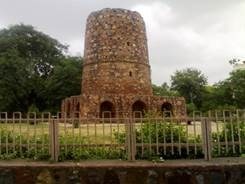 Chor Minar has now become the meeting point of people of the nearby colonies. Evenings see people chatting while the kids frolic about. 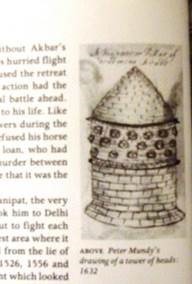 Little did the Alaudin Khilji know then that this horrific Minar would become a recreational park in the years to come! And little do the kids know that they are playing on a ground that was once soaked with blood. 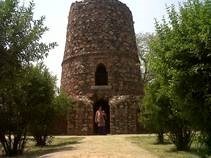 I visited this tower for my passion for history, to understand the secrets every monument has and for my undying love of Delhi. Of course, all said and done perhaps the gory past of the place remains subconsciously embedded in memory hence, I hold reservations about visiting this place after dark! Chor Minar in its silence, screams of a sinister warning – Beware !!! 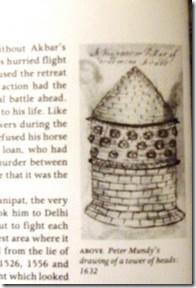 This entry was posted in History and tagged Chor Minar. Alaudin Khilji. Bookmark the permalink.